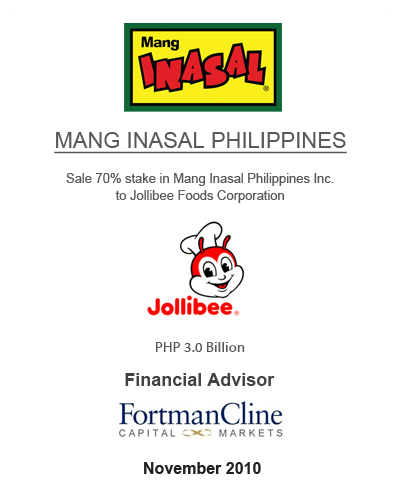 In 2010, Fortman Cline advised Edgar “Injap” Sia in the 70% sale of his local barbeque fast-food chain, Mang Inasal Philippines, to Jollibee Foods Corporation, the largest fast-food company in the country. The deal was valued at over US$100 million and stands as the largest strategic monetization in the Philippine fast-food industry in recent history. Edgar Sia started Mang Inasal with just one store in 2003 and has grown the franchise to over 460 stores in 2013.